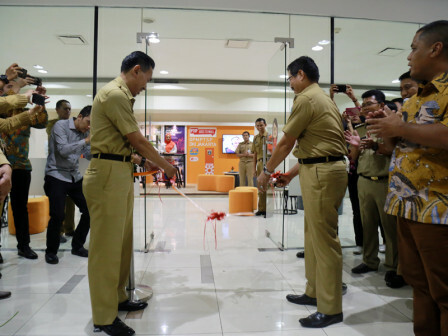 Jakarta Investment and One-Stop Integrated Services (PMPTSP) inaugurates PTSP Goes to Mall Role Model at Blok M Square, Kebayoran Baru, South Jakarta.
" Thus residents can get optimal services"
It will be a role model because its service is made different from the former version since the new PTSP Goes to Mall will operate permanently, in this case, it will be opened on 3A floor. Jakarta PMPTSP Dept. Deputy Head, Denny Wahyu Haryanto said, PTSP Goes to Mall intends to provide closer permit administration services thus his side plans to place it in locations that can be accessed easily by public. "We want residents to know more about PMPTSP Dept. and its services. Including to get detailed information related to permit and non-permit administration," he stated on the location where inauguration is held, Tuesday (9/4). Not only facilitating people in administrating permit and non-permit matters, but he hope this new innovation could support better investment in Jakarta. Thus in order to achieve it, PMPTSP Dept. is targeting to open 126 PTSP Goes to Mall in all Jakarta areas this year. It will be operated on the weekdays and weekend. "Thus residents can get optimal services in more interesting and innovative way in PTSP Goes to Mall," he conveyed. Meanwhile, South Jakarta Mayor, Marullah Matali added, there are 78 PTSP service points in South Jakarta. Besides Blok M Square and Public Service Mall, PTSP service points are also located in 65 urban villages, 10 sub-districts, and South Jakarta Mayor office. "Recently, many entrepreneurs in South Jakarta. Its economic activity is also high," he stated. This new service, he continued, will make it easier for people who want to propose for permit and non-permit certificates at the same time. "We will serve all customers according to the regulations," he affirmed.